N,N-Dimethylaniline is an important precursor to dyes and pigments. It is a promoter used in the curing of polyester and vinyl ester resins. Moreover, It can be used as an intermediate to vanillin, a stabilizer for colorimetric peroxidase determination or as a reagent in chemical synthesis. N,N-Dimethylaniline (DMA) is colourless or pale yellow to brown, oily liquid with characteristic amine-like odor. DMA is less dense than water and insoluble in water. Freely soluble in alcohol, acetone, benzene, chloroform, diethyl ether, ethanol and acid solution. Stable under ordinary conditions of use and storage. Combustible. Dimethylaniline is a weak base incompatible with strong oxidizing agents, strong acids, acid chlorides, acid anhydrides, chloroformates, halogens. It emits toxic fumes of nitriogen oxides, carbon oxides, and aniline when heated to decomposition. N,N-Dimethylaniline is used in the manufacture of Michler's ketone which is a chemical intermediate used in the synthesis of many dyes and pigments, particularly auramine derivatives. These pigments are used to dye paper, textiles, and leather. The main types of the dyes that can be manufactured from DMA are alkali light yellow, alkali purple 5BN, alkali light green, alkali turquoise blue, bright red 5 GN, bright blue. N,N-Dimethylaniline is a key precursor to commercially important triarylmethane dyes such as Malachite green or Crystal (Gentian) violet used as a histological stain and in Gram's method of classifying bacteria. 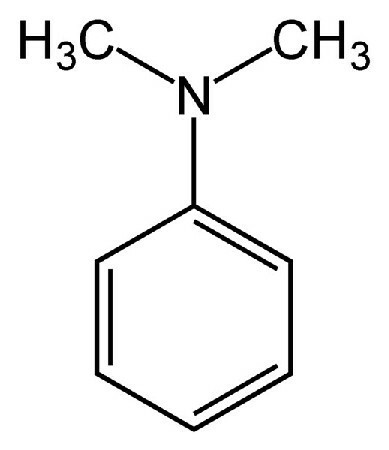 N,N-Dimethylaniline serves as a promoter in the curing of polyester and vinyl ester resins. This compound can be used on its own with benzoyl peroxide (BPO) type catalysts or in combination with cobalt 6% promoters with methyl ethyl ketone (MEKP) type catalysts. These systems give rapid cure at room temperature. DMA helps the catalyst to start the chemical reaction. Promoters must never be mixed directly with catalyst since a violent explosive reaction results. DMA is used as a stabilizer for colorimetric peroxidase determination. N,N-Dimethylaniline is used as an intermediate to manufacture vanillin. DMA is used to manufacture cephalosporin V, madribon, sulphormethoxine and flucytosine in medical industry. It is used as an acid scavenger in the synthesis of penicillins and cephalosporins and has been reported as a contaminant of commercial preparations of those antibiotics at levels of up to 1500 ppm. Specialty industrial solvent and rubber vulcanizing agent. Catalytic hardener in certain fibreglass resins.